One of our readers sent in a couple of news tip about how the Brazilian Government is launching a massive investigation into the corruption associated with the 2016 Olympic Games. OAS, one of Brazil’s biggest construction firms, filed for bankruptcy protection in March after its credit lines dried up. OAS is part of the group that is behind the very much delayed Deodoro Sports Complex. Mendes Junior SA backed out of a contract to fix the drainage around the Maracana soccer stadium set to host Olympic matches. 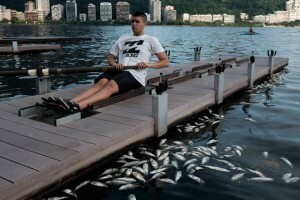 Rio has admitted it will fail to make good on promises it made in its Olympics bid to improve the sewage system and reduce water pollution in the Guanabara bay by 80 percent. Forgive me, but the fact that the Rio government is bailing out construction companies is quite concerning. Moreover, it appears the Government too itself is at fault for not paying these construction companies in time so they can complete payroll and pay operational costs. Combine that with the recent discovery that Glanders disease was discovered at Rio Olympic Sites, we have a disaster beyond our imagination waiting to happen. Even Ganders is recognized by the Center for Disease Control as something that could potentially infect humans, despite it normally affecting animals. What we have here ladies and gentlemen, is a diseased ridden country, with corruption that’s touched all corners of the Rio government that it can’t even pay its own vendors on time. Moreover its these same vendors who are caught in a massive investigation on accusations of bribery and corruption. We are ONE YEAR AWAY from RIO and we’re just barely dealing with this? I walk away in disbelief in this article that two construction firms are in massive trouble, with one of Brazil’s largest firms about to go under because of the sheer crushing volume of debt and another one who’s broken contractual agreements (likely because of the lack of payments from the Brazilian government). That’s two construction companies who are likely not operating or assisting in construction. We also have two means of infectious diseases impacting guests and athletes of the 2016 Olympic Games: From contaminated water and sewage impacting the Guanabara Bay AND now Glanders impacting horses, trainers, vets, and countless others. The 2016 Olympic Games is becoming a death trap. There are no backup plans for ANY of the venues, and right now, both animal and humans lives are at risk. If I was an athlete, I would say no to Rio. If I was a coach, I would be demanding the IOC move the 2016 Summer Olympic Games right now. It’s clear that no amount of money thrown at these problems will correct these problems in a manner that would be safe for both spectators and athletes. The most valuable currency the Rio and Brazilian Government needs is time, and it is something they do not have enough of. It is after all one year until the 2016 Summer Olympic Games. Will Rio deliver the 2016 Olympic games on time?